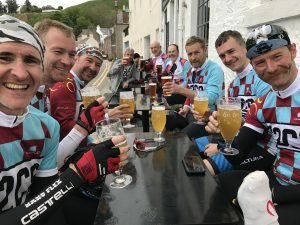 As the 56 riders in C2C9 rested their legs each evening, there was a patter of collective thumbs on devices as they pushed to crack the £60,000 fundraising target. I was watching it edge up on the Thursday night before the event, but now it was racing like a stopwatch as the anticipation of us completing the 250 miles grew. Clearly many sponsors wisely wait to see that their entrant is going to actually make it, fair dues, but it’s also a fantastic lesson that you should not stop reaching out. There’s always one or two who intended to donate and didn’t quite get around to it and then there’s that other WhatsApp list in your phone you didn’t get around to trying, combined with maybe a more enthusiastic plea having immersed yourself in the event. The team had also been probing me about the charitable work of Crew, each of these little interventions creating a more passionate and engaged fundraiser! By Saturday midnight it was done, the last £10K in just 3 days. The online figure bounced over £60K with a giftaid addition of a further £8K, and as our tired brains considered the relatively simple math to add the BP match giving, we could see the total was going to surpass a massive £150,000: over £35,000 per charity. I couldn’t wait to share the news, such a meaningful chunk of cash for each. Take a look at the total and the scale of some of the individual donations, it’s very impressive! 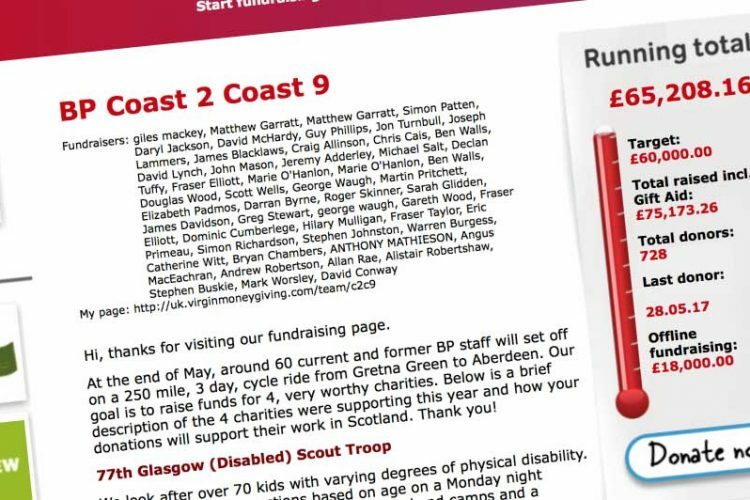 Indeed the impact of the whole Coast to Coast campaign over the last 9 years is hugely impressive, with over 1.1 million pounds raised for charity. It is also completely driven by the staff and C2C committee who recruit riders from all tiers and put together a terrific team. Riding with us the year was the president of BP North Sea. OK, so not every moment stopped was spent fundraising. Pints permissible at the end, and yes we did get donations from the bar and curious clientele!